Corona for C4D Alpha 6 RC2 released! We’ve been hard at work, listening to the feedback on Alpha Release Candidate 1, and are pleased to announce that RC2 is ready for you to test! The Release Candidates for Alpha 6 are all about stability, and finding and resolving bugs and crashes, with the aim of getting it stable before we call Alpha 6 final and move on to Alpha 7 (which will focus on Interactive Rendering and Team Render). Please test RC2, and let us know any bugs, problems and issues with the features in there – you’ll find the links to the bug reporting page and the forums at the end of this blog post. Some people were asking about Interactive Rendering in A6. The choice for that was removed from the rendering options, but there’s still a dropdown that says Start IR in the Corona VFB – this dropdown option actually runs a regular render, since IR is disabled in A6 (so, if you try it, then changing anything in the scene won’t change what is being rendered). This is by design, as until we focus on its stability in A7 there would inevitably be crashes using IR at the moment. We didn’t want people having the frustration of repeat crashes, so simply turned it off for now. is it necessary to delete the previous R1 version before installing this R2 in C4D or will it overwrite and update automatically? Please work normal maps, thanks in advance. normal maps don’t work correctly. Denoising Final Render work but Multipass layers not work Denoise . I have installed RC2 with r18 latest version on OS X 10.11.2. I get a crash every time I try to create a Corona material. All other operations seem ok. Same here, el crap 10.11.6. Crashed every time I tried to create corona material or when trying to render without materials. Pretty much useless now. first of all I want to say Thank you to the programmers. version for cinema is comming out. GB Ram and 32 cores. Does anyone has an Idea what the problem could be? not experiencing the same here, textures just load file, it’s probably an OS issue or you could report to Corona via their bug tracker. I said with a keen use of the new version, but very bad. It’s crashing all the time. You are getting into it with every new version. Normal map still does not work correctly. I have tested Corona RC2 on two Mac computers and it doesn’t work at all. It crashes while using the interactive renderer. And it always crashes (without fail) when I try to create a new Corona material from the Corona material manager tab. Please send us a request to support@corona-renderer.com . We’ll do our best to help! -Option for myst or fog (maybe there is a option but don’t find that yet). -Volumetric lights (maybe there is a option but don’t find that yet). -Batch render with C4D-Render Queue don’t works for me. It never finish and it never goes to the next render-job. I was wrong about the issue of the Render Queue. Render Queue with corona works just fine. Sorry! Was rendering in very high resolution with denoising. The process of denoising took a additional 20 Minutes in that high resolution…. If you have any trouble with that, contact us at support@corona-renderer.com . Hi, do you mean when visiting our blog, or corona-renderer.com in general? We have not received any similar reports yet. I’m on mac pro (Sierra) and C4D R18. Corona VFB calculate without end …. Hi, please contact us at support@corona-renderer.com – we will do our best to solve the issue swiftly! Is it possible and if yes how it’s possible to render with more than 1 computer on the same frame? Any manual or tutorial out there? I would be grateful for any answer! Will the Beta-Version also be open for everyone or only for selected Beta-Testers? 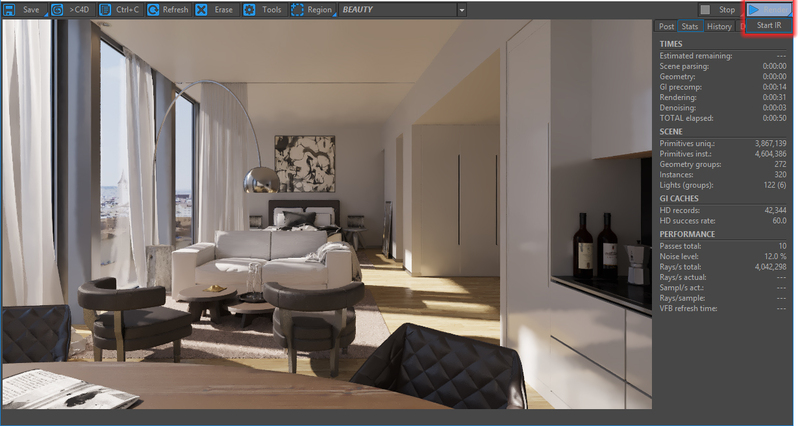 At present the beta is available to everyone, released as the Daily Builds – see the forum at https://corona-renderer.com/forum/index.php/board,40.0.html for details and download!